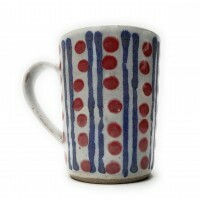 Mug with stripe and dot glaze decoration. 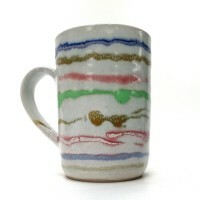 A unique mug with bright trailed glaze decoration. Dotty. 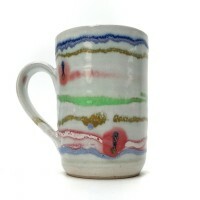 Size: 4" height x 3" diameter. Care: Microwave & Dishwasher safe. 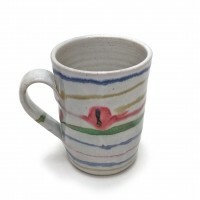 This pot is not repeatable - Only one available. 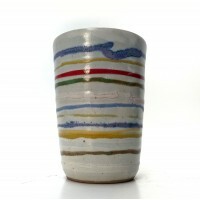 Mug with blue, yellow, red, green and reactive glaze decoration in bands, on a white ground.Hand thrown mugs with signature decoration applied with glaze trailers on the banding wheel. 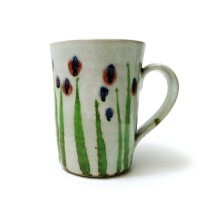 Each one is unique.Care: Oven ..
Hand thrown, hand decorated mug with blue resist decoration. Blue on dark blue outside, white inside. 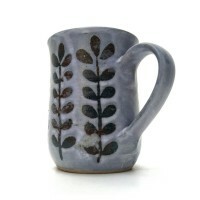 Resisted leaf decoration.Size: 4" height x 3" diameter.Care: Microwave & Dishwasher safe.Materials: Stoneware.. 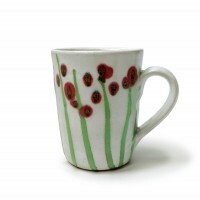 Mug with Poppy decoration, on a white ground.Hand thrown mugs with bright floral decoration in green and red applied with glaze trailers. 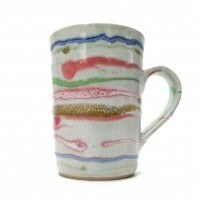 Each one is unique.Care: Oven / Microwave / Dishwasher safe.Materials: S..